Tall Tales Productions: What time is it? AdventureX Time! What time is it? AdventureX Time! No, not a typo, just a note that AdventureX 2014 is coming up! 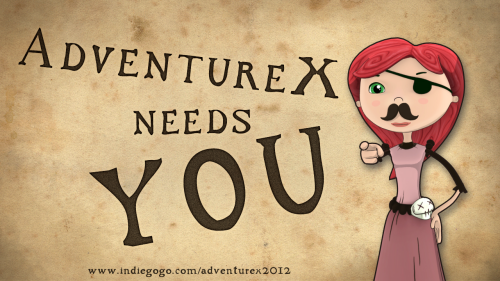 AdventureX is the point-and-click-adventure expo, hosted in the University of East Anglia, London, UK, usually in early December. This year, it's December 7th / 8th - and I'm going to be there! Together with the guys who were Skybound Studios and are now Everture Studios, Ltd. And we're going to bring a whole lotta monkeys with us. No, seriously! So if you're in or near London on the upcoming weekend, why not visit us?